After all, no small business can survive without having some kind of idea of what they’re thinking in terms of payment. It’s a jungle out there, really; the bottom line is you have to know how much you’re looking for. Big problem, though: sometimes the price can be too much, and then you lose your prospect. However, too little, and you’re not meeting your business budget and bottom line. This app from the Google Marketplace, though, can help you find that happy medium…. That’s the rub about pricing: it’s not necessarily about how much or how little your dollar amount is; it’s how you present it. If only you could have your auto attendant do such a thing. So you’re in the board room or meeting room of your small business, and you have some prospects at the table. Task at hand: you’ve got to sell your product, and sell it well. The challenge? Making a great presentation, a great proposal. That’s where the Quote Roller comes in. 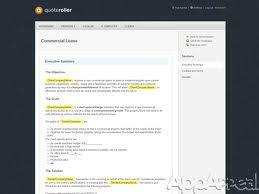 The one benefit of the Quote Roller is convenience and time management; in essence, it takes your one hour of planning on a proposal and does it for you. Hence, you save an hour, an hour you can better use for other things in your business. It’s easy, really — all you need to do is sign up and create an account. Before your very eyes, you have a customizable system designed to help you create some snazzy proposals a lot faster than if you had a whiteboard, spare paper, and maybe a few members of your team offering you some feedback. Some features include a photo site for placing pictures, a video site for uploading viral content, and even a placeholder for an e-signature. As always, in this day and age, everything’s going digital. The Quote Roller takes the idea of a proposal and turns it into a cyberspace tool. Prospects from overseas or wherever can buy your product right then and there without a plane ticket. In addition, you have the ability to attach any files you want directly as well as all kinds of multimedia. In direct line with online invoicing, the CRM tools available make it much easier to conduct business without having to bring possible prospects into the office. That saves the stress on the cleaning staff, really! But Maybe You Like an Office Presentation Better? Here’s the thing. 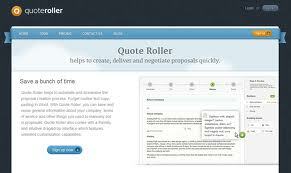 If you know how to use the Quote Roller well, you probably know how to do up a good proposal even better. So the only benefit of this app is the act of doing your proposal, basically, online! If that’s not your cup of tea — if you prefer the personal nature of an in-the-flesh meeting with the prospects, so they can see and experience your business in person — then you might not find the Quote Roller all that useful. That’s up to you, though. Whatever floats your corporate boat. Or yacht. Or battleship. Or aircraft carrier. Either way you’re looking at it, if you have your crosshairs aimed at one target price, the Quote Roller helps you fire that missile at the right time, so you knock that bogey out of the sky. 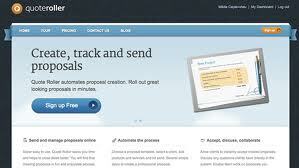 That drives businesses — the idea of selling your proposals, obtaining new clientele. When the day’s over and the sun sets behind the ocean horizon, you come home and celebrate that your business is booming. In other words, you’re in an ace! This entry was posted in Marketing, Sales, Small Business by Pierre. Bookmark the permalink.